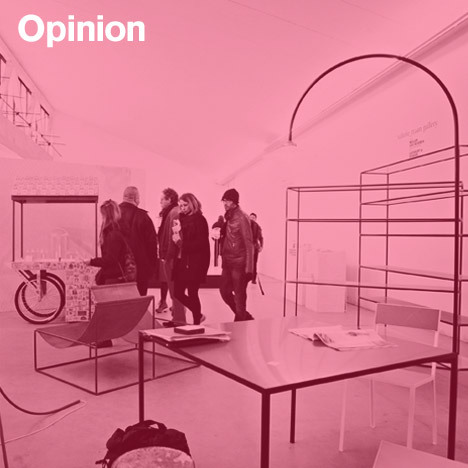 Opinion: Dezeen editor-in-chief Marcus Fairs reports from Milan design week, where he finds a city seemingly determined to make life unbearable for visitors. Grey skies over grey buildings make for a grey mood. I’m in Milan for the annual design fair and it’s impossible not to be affected by the miserable weather. But the unseasonal chill that has descended on this dour northern Italian city seems to be a metaphor for the fortunes of the world’s biggest design gathering. The Fuori Salone events around town feel much less busy than in recent years. You can walk down Via Tortona without running the risk of being crushed to death. Exhibition spaces are unfilled. Taxis are plentiful. I’ve met people who’ve found hotel rooms at the last minute - and not been ripped off. All these things would have been unthinkable in previous years. There’s also little sense of the excitement of past years when Twitter, SMS and Bar Basso would be buzzing with hot tips and must-see recommendations. As one designer said to me the other night: “It must be a bad year – Alice Rawsthorn has hardly tweeted anything”. It’s not surprising, since Europe – and Italy in particular – is mired in a seemingly endless economic crisis and the Milanese design brands that form the fair’s backbone are suffering. None will admit it openly but I’ve heard talk of four-day weeks, extended summer shut-downs and mothballed research and development centres. But the arrogance and swagger of previous years has finally ebbed, and more than one local has nervously mentioned last September’s article by Julie Lasky in the New York Times, which declared that London had usurped Milan as the world’s design capital. I don’t (yet) agree with Lasky on this point and nor do any of the senior designers I’ve spoken to in Milan this week. For them, it’s still the paramount get-together of the year and the place where the key product launches take place. They love the city and desperately want it to thrive. Milan’s sheer size and heritage remain unparalleled. The Salone itself gets over 300,000 visitors and citywide an estimated half a million people are involved in the week in one way or another. Milan practically invented the contemporary furniture industry in the second half of the last century and the Salone, established in 1961, has long been the definitive fair. This dominance stems from the network of family-run companies, prodigious home-grown design talents and highly skilled artisans who collaboratively turned Milan into the furniture design and production capital of the world in the post-war era. Yet towards the end of the twentieth century the city’s stock of great designers mysteriously began to peter out – Sottsass, Castiglioni and their ilk left few protégés of note – and Milanese companies instead turned to foreign designers to design their products and give them marketing cachet. This has led to the curious situation today where rival Milanese furniture companies work with the same promiscuous pool of international names, resulting in product portfolios that are often indistinguishable. It’s hard to think of another industry where brands would allow their identities to be blurred in this way. Now the companies themselves seem to be under threat from more adventurous overseas operations that are making the running on their home turf. The most impressive individual show this year is the vast, lavish, recession-defying installation by Dutch brand Moooi. The most innovative new players over the past few years have been the Dutch-run Ventura Lambrate district and the MOST exhibition at the city’s science museum instigated by British designer Tom Dixon (and this year sponsored by US online retailer Fab.com). Unlike his Italian counterparts, Dixon understands the digital forces that are changing the way design is manufactured, marketed and sold. But the thing that most threatens Milan is Milan itself. The city treats fair visitors with contempt, allowing hotels to more than double their rates during the week, fleecing exhibitors with permits, bamboozling them with red tape (such as the Byzantine impossibility of getting a licence to sell products direct to the public) and doing nothing to help baffled foreigners negotiate the arcane taxi-booking system or the complex public transport network. There is little evidence of curation across the city, with good shows mixed up with dreadful ones. Cosmit, the company that owns and operates the Salone, has appeared to lose touch with reality in recent years, commissioning lavish cultural spectacles in the city or organising sprawling press trips that had no relevance to the business of selling chairs and lights. Through greed and mismanagement, the Tortona district managed to turn the most vibrant core of the fair into an overpriced, over-branded and overcrowded hell. The other districts and the Salone itself seemingly refuse to communicate with each other. There is no overarching organisation linking everything together, no decent free guidebook (the ubiquitous Interni guide is a navigational disaster) or map (although our digital one is pretty darned good) and – astonishingly - no agreed brand name for the week. Is it Milan Design Week? Milan Furniture Fair? I Saloni? The Fiera? Nobody knows. Milan’s hotels and exhibition venues appear to treat the internet as a nuisance, making it as difficult as possible for visitors to get online. Its design brands don't seem to be capable of printing enough press packs to last beyond the first day or setting up a functional and up-to-date online presence. "How can they produce such beautiful furniture yet do everything else so badly?" exclaimed an exasperated American architect over dinner earlier this week. Most incredibly of all, the Salone doesn’t even have a website, but rather piggybacks on the domain of its Cosmit parent, which provides little useful information beyond the dates of the fair. How can the world’s biggest design fair not have its own website? In short, to visit Milan during the Salone is to experience the antithesis of design. Given the sheer hassle and expense of attending, it’s little wonder people are staying away. Compare that to London, which has brought all its sprawling September design events under the London Design Festival banner with a clear identity, website, guide and purpose. London is ten times the size of Milan but the London Design Festival is ten times easier to comprehend. If I were a rookie foreign design journalist trying to choose between the two cities, I know which I’d go for. Another fair that understands the importance of the visitor experience is Kortrijk's Interieur design biennale, which last year made huge strides towards treating that experience as a design task. "I sometimes get a bit frustrated coming back from Milan and feeling that even though I travelled a lot, I missed a lot," its curator Lowie Vermeersch told me, pointing out the paradox that as a design fair, it "is not designed." But Milan doesn't seem to be listening. The one glimmer of light in Milan this year seems to be the Salone itself, which has been packed with visitors after several years in which it felt like an increasingly optional sideshow to the events in the city. Besides being under a roof and therefore offering one of the few warm and dry experiences in town, this was surely helped by the common-sense decision to at last present a high-profile and relevant design-related exhibition – Jean Nouvel’s Project: Office for Living show – at the fair itself, rather than in a remote palazzo. Last December, Cosmit appointed Claudio Luti - the savvy chairman and owner of thriving Milanese design brand Kartell - as its president and the word is that further long-overdue changes are afoot. Perhaps the next thing Luti should do is put together a high-powered Milanese design delegation, and visit London. Update 25/05/2013: Salone del Mobile president Claudio Luti responds to this article and promises to tackle issues that "damage Milan"